Johnson Hagood (1828-98), Brigadier General, CSA (SC). Participated at Ft. Sumter, 1st Manassas, Charleston, Petersburg, Ft. Fisher campaign. 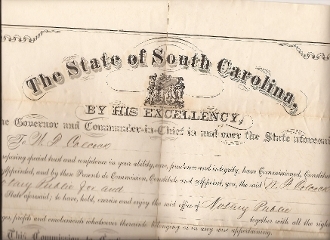 Document Signed (DS), Large folio, "The State of South Carolina", Commission for the office of Notary Public, 1/7/1881. Signed as Governor. Some edge splits, otherwise very fine. Too large to fit the scanner.